I am all for cosleeping with baby. To me, it is the most natural thing in the world. Sleeping next to baby, at least in the first 4-6 months, is the easiest way to multitask: respond to baby’s needs, nurse, feel comforted by knowing baby is okay and breathing, AND catch some sleep. But, for the sake of still feeling like a couple, try at least periodically to get baby to sleep, if only for a few hours, in a crib or bassinet. Even if baby wakes in the middle of the night and it is easier to bring him to bed, at least reclaim the marriage bed for the first hour after you have gone to bed. After baby, time is a precious commodity. Nighttime might be the only opportunity to catch up on work or personal projects. If need be, schedule a time for your date. And leave the phone or tablet in another room, lest it become the new bed partner! 2. Figure out if you are a distancer or a pursuer. Are you an Elsa or an Anna? The distancing and pursuing pattern, or dance, turns into a vicious cycle. Do you recognize yourself or your partner as one or the other? Just acknowledging your different styles, and understanding your partner’s behavior, can take the personal hurt and sting out of it. 3. Take time outs when discussions get heated. It is natural to become defensive when we feel attacked. The problem with defensiveness is that when we put up a wall to protect ourselves we are unable to hear and understand our partners. When we are flooded with emotions or finding ourselves in “fight, flight or freeze” mode, a time out can help. Marriage and family therapists, Kimberly Panganiban, LMFT and Andrea Knox, IMF, recently shared their advice for postpartum couples from a Gottman perspective at the last Postpartum Health Alliance lecture. The key to time outs, they shared, is to do something to truly relax. Don’t stew and keep yourself worked up about how “right” you are. In addition, couples often make the mistake of not coming back after a time out. Try to check in with each other after 20 minutes. 4. Offer your partner a massage. Knox and Panganiban shared that research on postpartum couples has demonstrated that giving and receiving massages from one another can lighten the baby blues. This is one way to turn towards each other when things are hard versus turning away. Psychologist and relationship expert John Gottman, Ph.D. has conducted research on 40,000 couples over the last 40 years. He identified the four above harbingers as predictors of divorce (with contempt being the strongest predictor.) If you and your partner are struggling frequently with “the four horseman,” it may be time to consult with a therapist. Contact me at abby@abigailburdlcsw.com or 619-289-7818, and if I am not a good fit for you, I will find someone who is. 6. Commit together to take a small amount of time and energy to devote to the relationship. 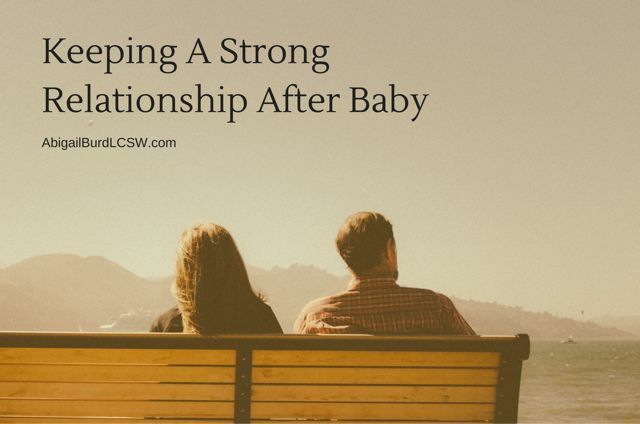 * This post was inspired by the Postpartum Health Alliance lecture in La Jolla on 6/17/14, “Postpartum Couples: A Gottman Perspective” with Kimberly Panganiban, LMFT and Andrea Knox, IMF of the Couples Institute of San Diego with Trish Stanley. Points with an asterisk were taken from their lecture. If you missed hearing about the previous PHA lecture, on helping parents overcome the trauma of the NICU experience, you can read about it here. And Baby Makes Three: The Six-Step Plan for Preserving Marital Intimacy and Rekindling Romance After Baby Arrives by John Gottman Ph.D. Title graphic made in Canva. Photo credit: Charlie Foster via unsplash.